“If you build it, he will come.” That’s the ethereal message that inspired Iowa farmer Ray Kinsella (Kevin Costner) in the movie Field of Dreams to construct a baseball diamond in the middle of his cornfield. That message resonates with me in many ways with regard to the recycling of agricultural plastics. Plastic products and packaging have become an integral part to all aspects of farming. 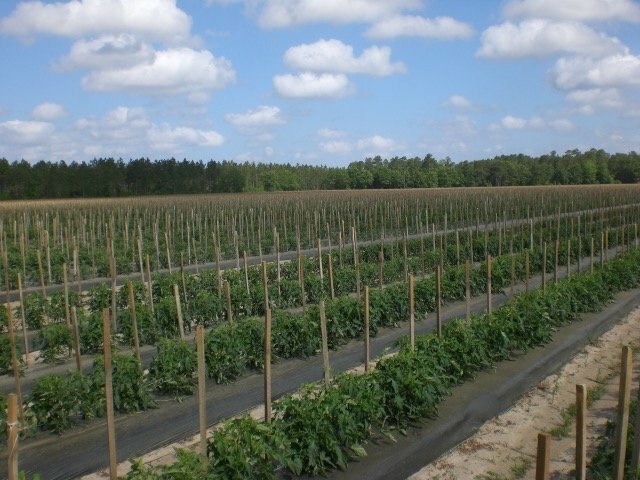 Plastic films are used to wrap forage, to cover greenhouses, and to mulch fields of vegetables and fruits like tomatoes and strawberries. Most nursery containers are made of plastic, as are the containers used for pesticides and dairy sanitizers. Irrigation and maple tubing are plastic. The list goes on. Much of it has been burned in the field, generating dioxins and other pollutants, or dumped in some out of the way place on the farm. In addition, plastics are buried in landfills. The options for farmers to recycle these used plastics have been neither robust nor sustainable. I have been working on the subject of agricultural plastics management since 1999 when the Southern Waste Information eXchange, Inc., a 501(c)(3) non-profit organization, was asked by the Florida Department of Environmental Protection to conduct a Technical Advisory Group or TAG on the subject of dealing with the large volumes of agricultural film mulch being generated in Florida on an annual basis. The following summarizes some of the background information on agricultural plastic use/generation as presented by Mr. Arthur Amidon of Amidon Recycling at that TAG in 1999. The total U.S. agricultural plastics generation is estimated to be 816 million pounds or 408,000 tons. This includes horticultural film, irrigation tubing, livestock plastics, miscellaneous row covers, nursery containers, and pesticide containers. Of the total 816 million pounds, 126 million pounds is estimated to be horticultural film plastic. Nursery containers are estimate to make up over half of all U.S. agricultural plastic – 422 million pounds. 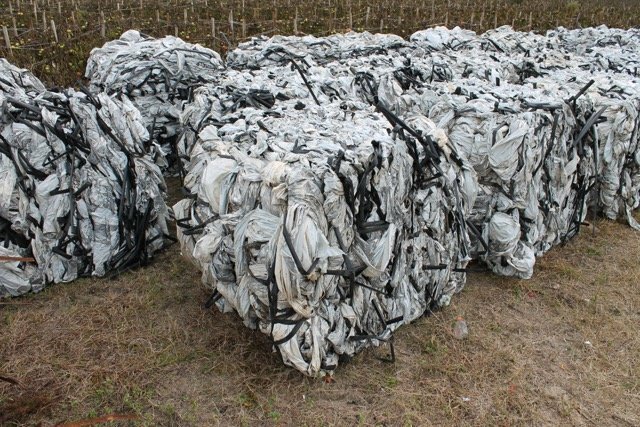 Florida waste plastic film mulch is estimated to be 25 million pounds per year of mulch and as much as 10 million pounds per year of drip tape. This mulch film is approximately 1/3 of all mulch film used in the United States. Additionally, Florida uses 6-8 million pounds (1/4 of U.S. use) of greenhouse and nursery film annually. Add up these figures and you are in the neighborhood of 40 million pounds/year in Florida alone. Very little, if any, of this material is recovered for recycling. It is either burned in small piles in the field (after the used mulch is gathered by hand laborers who pile it at the end of each crop row) or buried in Class I and III area landfills. (e) Disposal of solid waste resulting from normal farming operations as defined by department rule. Polyethylene agricultural plastic, damaged, non-salvageable, untreated wood pallets, and packing material that cannot be feasibly recycled, which are used in connection with agricultural operations related to the growing, harvesting, or maintenance of crops, may be disposed of by open burning if a public nuisance or any condition adversely affecting the environment or the public health is not created by the open burning and state or federal ambient air quality standards are not violated. The allowance of open burning of the material in the field, though it may save farmers disposal fees, has lead to a disincentive of the recycling of this material. 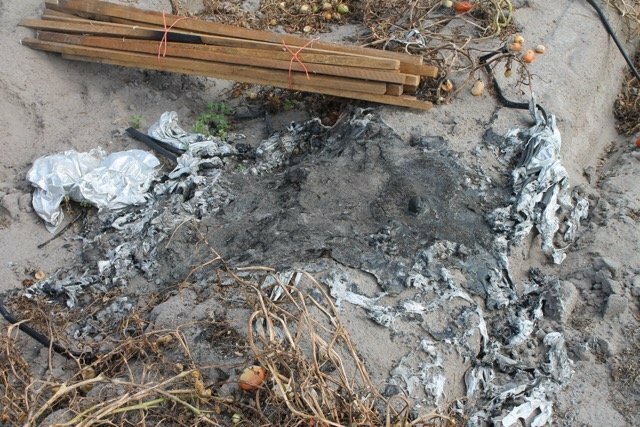 It should also be noted that health and environmental implications to the burning of the material in a non-controlled environment may lead to potential negative environmental and human health impacts. So what is the issue with the recycling of agricultural plastics? Why has the recycling of agricultural film mulch been so unsustainable? The answer comes down to contamination level. Mainly soil. Take a look at the bales of ag film in this picture. These are bales that are generated by a tomato farmer that is having his film recovered for recycling overseas. These types of bales are produced from a Bacca Baler or Big Foot Baler that are on the market to bale Ag film in the field. The bales weigh in the neighborhood of 1,250 pounds. What looks like all recovered film is actually on average about 60 – 70% soil and moisture. Yes, you read it correctly, 60 – 70% soil and moisture!
. 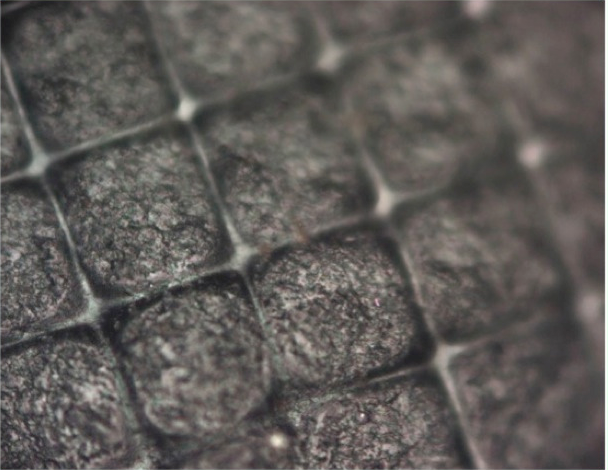 That is how small the micro pattern is. The soil contained in the recovered film causes havoc with shredding equipment. 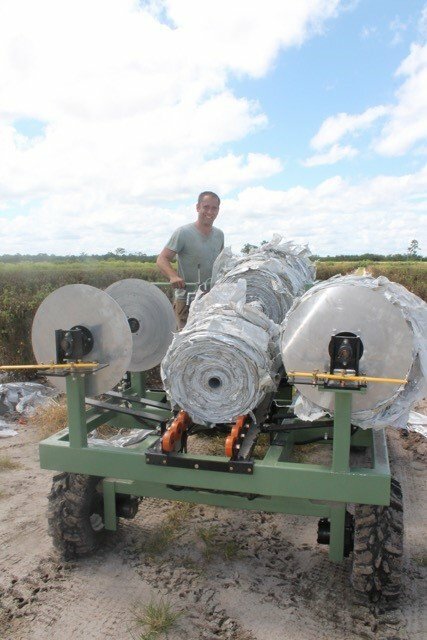 During a trial with Suwannee American Cement (SAC), we sent 3,500 tons of baled Ag film for an alternative fuels trial. The film was shredded in a primary dual shaft shredder then feed into a single shaft secondary shredder with a 2 inch screen to be pneumatically injected into the kiln. Ag film has great BTU value but not with the amount of soil contamination that was discovered to remain on the film. 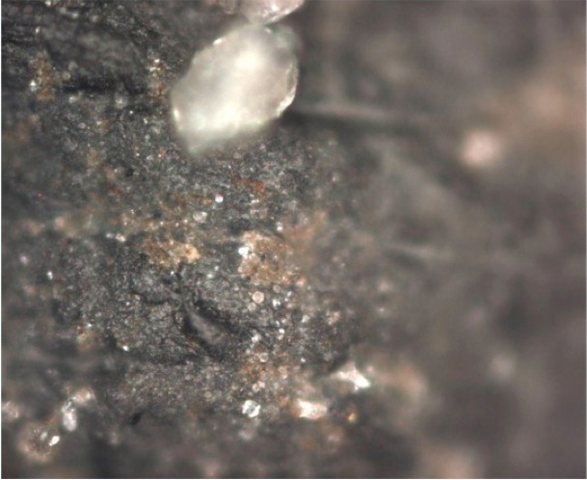 The film burned at such a high temperature (> 2,500F ) burns much cleaner than coal which is traditionally used by most cement kilns. The amount of soil contained on the film forced SAC to change out its shredder blades at the end of every week at the cost of $16,000 a pop. After the trial was over the SAC said Thanks but No Thanks to any more Ag film. Lesson learned the hard way. Several players are coming on board to address the issue of recovering agricultural plastics, mainly agricultural mulch films from the field and recycling it. Command Packaging/Encore Recycling based in Salinas, California opened up a state of the art closed-loop system last year to divert discarded agricultural plastics from landfills and recycles it into high quality raw material. The recycled plastic is then sold to manufactures who in turn make more recyclable products. Some of the largest multi-national and recognizable names such as, Dole, Driscoll, Pacific Gold Farms, Ramco, Red Blossom Strawberries, as well as many independent growers, are working with Encore® Recycling to ensure that their plastic is collected and recycled. For more than a decade Delta Plastics has collected used irrigation tubing and recycles it. Delta has branched out and is looking at agricultural mulch films as well. Their fleet of collection trucks picks up used Ag plastics from authorized collection sites to provide farmers with a free, convenient way of removing agricultural plastics. Delta recycles the used material to produce a postconsumer resin that is then used in various plastics industries. Brand new to the market are firms like RecyPoly to be located in Labelle, Florida and Florida Agricultural Plastic Recyclers, LLC to be located in Avon Park, Florida. Both of these firms are setting up shop to be able to recycle agricultural mulch films and drip tape. FIELDClean of Florida has developed a process of extracting agricultural films from the fields and then integrate the collected films into a proprietary dry cleaning process called FilmCleanTM. The first plant is now in operation in Valley Alabama. 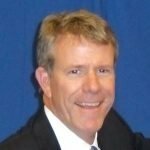 The company plans on setting up several micro dry cleaning plants in Florida. The advancements and interest in agricultural plastics recycling is coming for sure just as Ray Kinsella envisioned his baseball field being built, I envision a sustainable solution for agricultural plastics in the not too distant future. Agricultural plastics represent a Field of Green$, not just from an environmental standpoint, but from an economic standpoint as well.